Walter was born in Aldham in 1895. The 1901 Census report him as living at home at Cooper's Cottage, near Wolves Wood with his parents John and Rose and his siblings; Louisa (17), Nellie(11), George(9), Arthur (7), James(4), Norah(2), Alfred(1) and infant Annie. By the time of his death in 1918, Walter had 9 sisters and 4 brothers. Cooper's Cottage is on the parish boundary between Aldham and Hadleigh and after the war there was some debate as to whether his name be added to the Hadleigh memorial. In the end he was added. 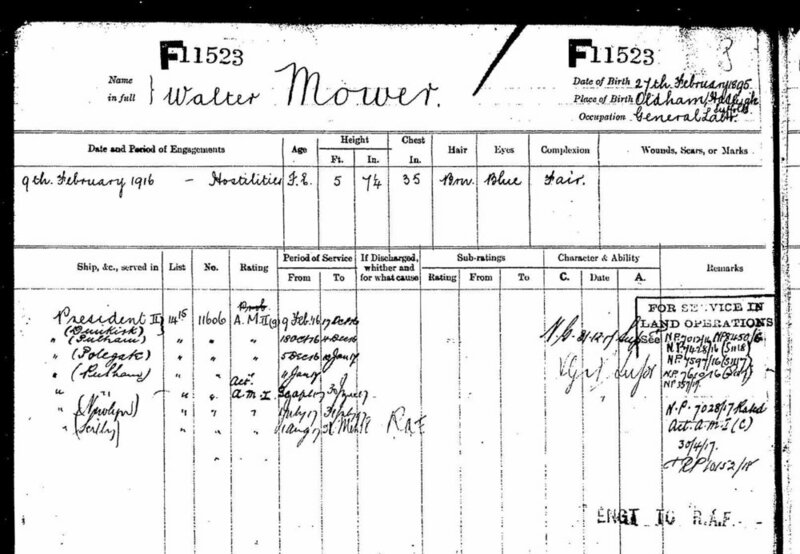 However, there was an error and he was initially listed as Frederick Mower. By the time the error had been spotted, Frederick had already been inscribed onto the war memorial panel. Before the war Walter worked as a horseman and a general labourer. He enlisted into the Royal Navy on 9 February 1916 and was trained as an Air Mechanic with the Royal Naval Air Service. This would have been an exciting time as aviation was relatively new. Walter would have seen some of the earliest aircraft and no doubt would have seen lots of new innovations as the military tried to exploit this new technology. Once the station at Tresco was opened, the first patrol was undertaken on 28 February 1917 and the first conclusive action took place on 27 May 1917, when an unidentified U-boat was spotted, on the surface, off Bryher. Before diving the U-boat shot at and holed the aircraft's radiator, which was temporary fixed by one of the crew climbing onto the wing and plugging the hole with a handkerchief! The flying boat dropped two bombs and onshore observers witnessed the submarine's stern rising out of the water at an angle of 60° before she sank. Subsequent research suggests that the U-boat may have survived the attack. The crew of the Curtis Type 12 were later decorated. By the summer, full facilities had been established and from August there were around 22 planes including Short Type 184 and Felixstowe F.5 flyingboats. Over the next two years and half years Walter served on at least one ship and a number of land bases. In August 1917 he is sent to join the Air Constructional Section at the Royal Naval Air Station at Tresco, in the Scilly Isles. RNAS Tresco was located some 30 miles to the SW of Land's End out in the Atlantic and Celtic Sea. Walter's squadron operated sea planes from New Grimsby bay and their job was to guard the western approaches to the English channel. On a number of occasions, the squadron spotted and then engaged with enemy U-boats (submarines). We are not sure if Walter flew as part of the aeroplanes crew, but we do know that some Aircraft Mechanics did fly. When the squadron was first established at Tresco, locals thought that the bay was too exposed for the relatively fragile flying machines. There is no doubt that the weather conditions in the Scilly Isles can be very rough, but despite this the Squadron still managed to operate successfully. On 1 April 1918 the Royal Air Force was established and shortly after units from both the Army's Royal Flying Corps and the Royal Navy's Air Service were transferred into the newly formed organisation..
On 18 August 1918, Walter's unit was transferred to the RAF. At that time they were operating Short Type 225 seaplanes. They carried out their last patrol on 10 November 1918, by which time all four Flights had been fully incorporated into No. 234 Squadron, RAF. Although the unit was subsequently disbanded after the war in May 1919. As the war was coming to a close, Walter fell ill, he contracted pneumonia and died on 7 November 1918 at the age of 23. His body was transferred home to Aldham by boat and then train. Walter's funeral was held on 12 November 1918 at Aldham church, close to where he grew up. His coffin was draped with a union flag and local men of the 5th (Volunteer) Battalion of the Suffolk Regiment formed a guard of honour and fired a volley of shots in salute over the coffin. An aeroplane of the RAF slowly flew overhead throughout the service and burial. The chief mourners were Walter's parents, 9 of his sisters and 1 brother. Sadly 3 of his brothers were on active service in France and could not get leave to attend the funeral. We hope that this page has been able to tell the story of Walter Mower. If you know of any information which might help to add to the story then please get in touch.